Itchy-rash plants are the plant kingdom's version of yellow jackets, mosquitoes, and the like. Not only do you have to watch out for the burning sting that yellow jackets can inflict while you are going about your business in the yard, but there is a weed (stinging nettle) that can also burn you and cause itching. And while those who fail to practice mosquito control are doomed to suffer itchy stings, everyone knows that the skin rashes caused by poison ivy are no picnic, either. What you may not know is that you can also come down with an itchy rash from contact with lesser-known noxious weeds that commonly grow in the yard. Yes, there is a skin rash just waiting to happen when you step out into your yard. Learn to identify the plants in question. Once you know what they look like, you can eradicate them (or, at least, avoid them). Stinging nettles cannot swoop in on you and deliver a burning sting, as yellow jackets can. But if you accidentally run through a patch of these plants with bare legs, it will feel a bit like a swarm of tiny yellow jackets just attacked your appendages. Do you depend on the rhyme, "Leaves of three, let them be!" 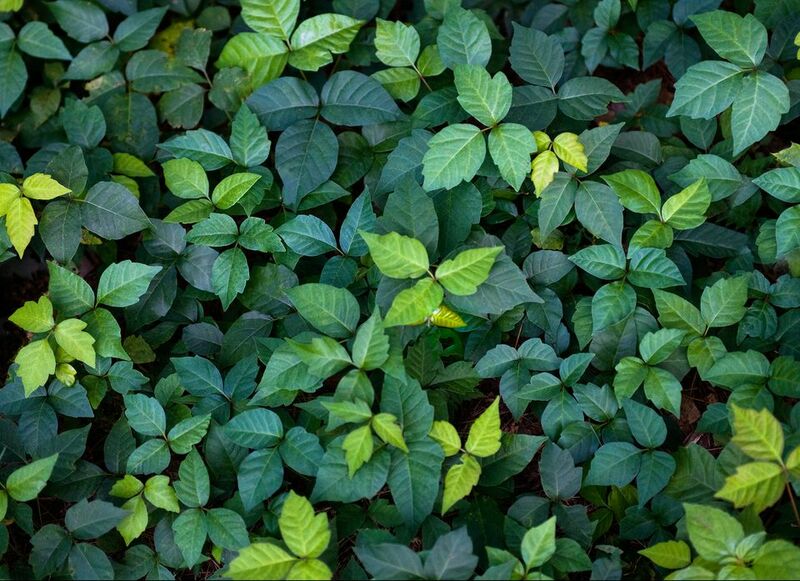 to identify poison ivy and poison oak? You should not. While it is true that poison ivy has three leaves (as does poison oak), these plants are far from being the only weeds with three leaves. Moreover, the rhyme is quite useless for poison sumac identification, because poison sumac's leaf is shaped like a feather. So instead of relying on rhymes, learn to identify these plants properly. It is widely recognized now that the ragweeds (both the giant variety and common ragweed) are the worst culprits behind hay fever in the autumn. What is not so widely known is that the ragweeds can also cause skin rashes if you touch them. Once you learn what ragweed looks like, remove it from your property (while wearing gloves, a long-sleeved shirt, etc.) so that you do not accidentally brush up against it while performing yard maintenance. The story of the arrival of giant hogweed (Heracleum mantegazzianum) to North America is a common one. Like Japanese knotweed (Polygonum cuspidatum), for example, it was discovered growing in its native Asia by Western plant explorers, who found it highly ornamental. They brought it back with them, first to the U.K., then to the U.S. Only after it had escaped into the wild in its new homelands did people start to realize what a potent enemy they had let in. In fact, the potency of giant hogweed is indicated in its genus name, Heracleum, a nod to Heracles, the famously powerful hero of Greek mythology. This weed may, in fact, be the worst of the itchy-rash plants. It can cause not only rashes but even blindness. Even some highly-valued plants like Christmas poinsettias can cause rashes and make you itch (or worse). It is a myth that if you eat a poinsettia leaf you will die, but do not let your guard down about poinsettias. It so often happens that in the process of busting of one myth, it spawns another. The new myth surrounding poinsettias is that they are totally harmless for everyone. That is simply false.